The Bank of Canada raised its target for the overnight rate by 25 basis points to 1.75 per cent this morning. With this decision, the Bank noted that the overnight rate will need to rise to a neutral stance to achieve its 2 per cent inflation target. 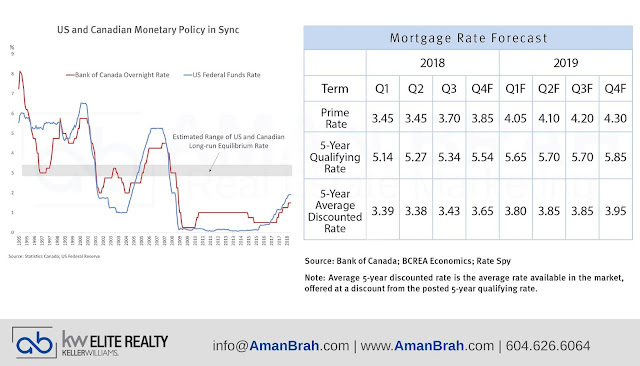 The Bank of Canada is determined to finally “normalize” it's monetary policy after nearly a decade of low interest rates with the goal of returning the overnight rate to its estimated equilibrium or “neutral” level of between 3 and 3.5 per cent. Policymakers have even discussed dropping their gradual approach, replacing the standard 25 basis point increment rate increases with more accelerated interest rate increases. Analysis). You'll find one of the cities biggest infrustructure projects in it’s first phase, the New Recreation Complex, slated to be completed in 2021 just down a couple blocks away. A proposed adjacent private development to the new complex is to include a mix of apartment buildings, seniors' and rental housing, and a restaurant or café. There is new development all around this property and area. Call today for your personal showing!